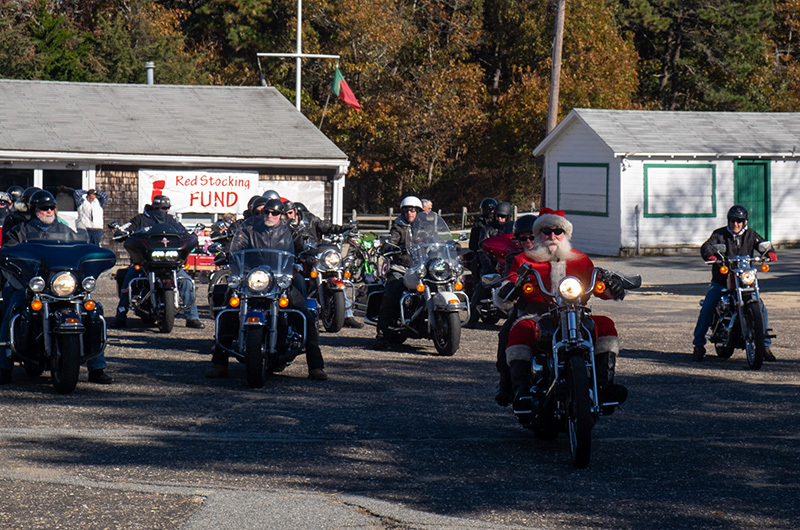 Mike (Panhead) Fuss leads the way for the Martha's Vineyard Harley Riders toy drive for the Red Stocking Fund. Santa Claus is known for riding a sleigh throughout most of world. On Martha’s Vineyard, he rides a Harley and his name is Mike (Panhead) Fuss. 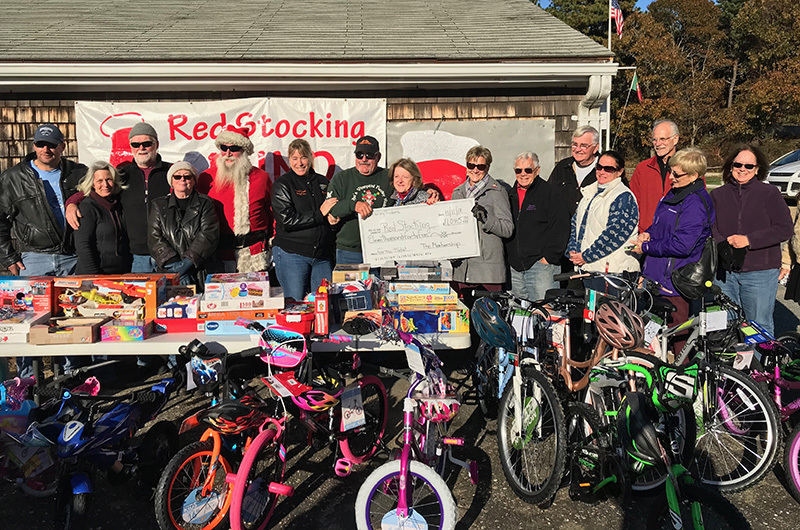 The event is part of the annual Red Stocking Fund toy drive, where the Martha’s Vineyard Harley Riders club circles the Island picking up gifts for needy children and helping to donate over $11,000 to the charity. The Harley Riders have teamed up with the Red Stocking Fund for the past three decades. The fund, started by Adele Crist in 1938, has spent 80 years ensuring that Island kids receive art supplies, boots, hats and mittens, as well as an item on their Christmas wish-list. “She [Adele Crist] asked friends if they would help out, make sure kids had something to eat, something to wear, and something to play with,” said longtime volunteer Kerry Alley. “Christ, Crist. It’s no coincidence,” she added, referring to the creation of the Red Stocking Fund. This year, around 15 bikers gathered at the Portuguese American Club on Sunday to begin their 2018 route. Depending on the weather, the bikers head from Oak Bluffs to Sharky’s in Edgartown, circle around to Menemsha, go through Conroy’s in West Tisbury, and make their way back to Vineyard avenue, where a warm chicken dinner awaits their 1 p.m. arrival. Riders come from as far as Rhode Island to participate. Mr. Weatherbee came to the Island this weekend with his wife Clarissa. His flaming bandana was hard to miss. “Dude wrap,” Mr. Weatherbee corrected. John and his wife Linda Powers are two of the Vineyard riders who also participate in toy rides on the mainland. Mr. Powers couldn’t remember how long he’d been a part of the toy drive until he looked through his wardrobe earlier in the week. Although the Martha’s Vineyard Harley Riders have decreased in membership over the years, the enthusiasm from the 15 or so who came out on Sunday more than made up for the decline in numbers. Mr. Powers and others donated gifts such as board games, stuffed animals, Flyer wagons, and, most appropriately, bicycles. Fifteen of them, to be exact. “We bought all the bicycles in honor of Henrietta Gallagher,” said Randi Matthew, wife of Harley rider president Rainy (Rain Man) Matthew. Ms. Gallagher used to purchase the bikes for the Red Stocking Fund, but died three weeks shy of her 99th birthday in July of this past summer. Ms. Matthew, who owns a Road King motorcycle herself, stayed back to prepare the chicken dinner for the riders, which included legs, thighs, mashed potatoes, gravy, steamed carrots and green beans. When Mike “Panhead” Fuss rolled into the PA Club parking lot, his cheeks were about as rosy as the Santa suit he wore on the ride. Once everyone had warmed up and cleaned their plates, Rain Man Matthew, with his trademark sandpaper voice and Hulk Hogan moustache, revealed the total donations for 2018. The toy distribution day is Friday, Dec. 14, from 9 a.m. to noon at St. Augustine’s Church. 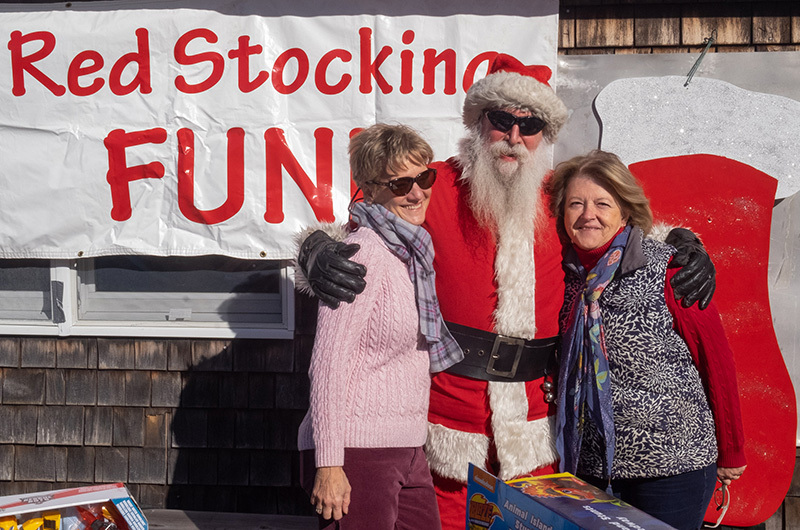 Donations to The Red Stocking Fund can be made payable to the Red Stocking Fund, Box 600, Edgartown, MA 02539. For gift donations or other information, contact Susie Wallo 508-776-6050. These men and women do an amazing job on this every year. Just for the record, it is actually Rene and Lisa Mathieu. Great Job MVHR!